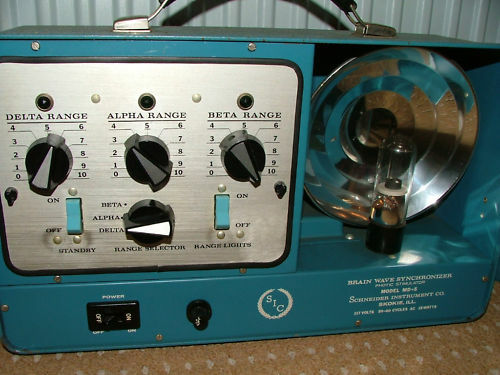 "After observing how some radar technicians had become “transfixed” by rhythmic flashing dots on their radar screens, inventor Sidney Schneider designed his Brain Wave Synchronizer (BWS) to hypnotize by visually stimulating subjects at frequencies mimicking those of their alpha, beta, or delta brainwaves. In 1959 Schneider and hypnotist-obstetrician William Kroger, M.D., published their use of the BWS in prenatal classes for thousands of women prior to its use as an “electronic aid for hypnotic induction” during labor and delivery [Kroger & Schneider, 1959]. Four years later, Chicago anesthesiologist Max S. Sadove, M.D., published his work on how BWS-induced hypnosis could reduce anesthetic agent requirements during general anesthesia [Sadove, 1963]. By 1994 the BWS would be cited for causing epileptic seizures in a patient."